We want local fiber. We want it organic. We want the people in every step of the process to be valued. We want to cause the least harm and spread the most good. Our region has an abundance of wool and diverse animal fibers, suitable for cool weather textiles and apparel, but for a hot summer day, working in the fields, a nice linen farm shirt would be ideal. 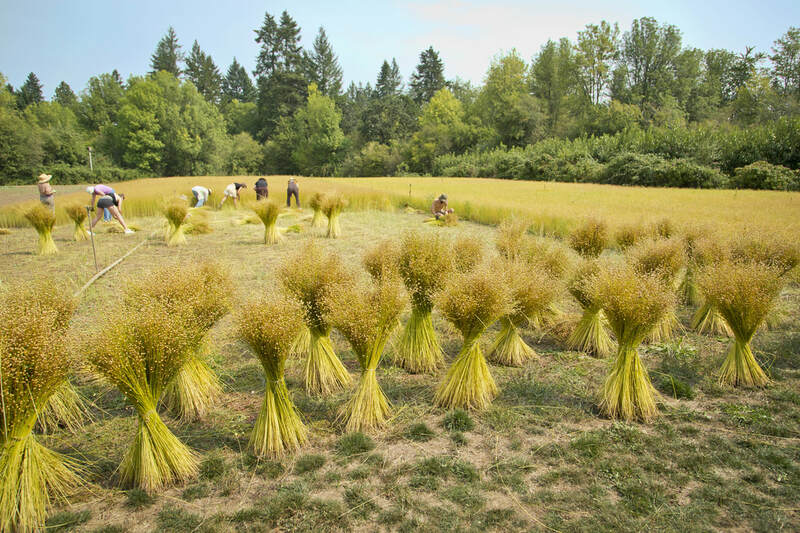 After thoroughly researching the successes and mistakes of the Willamette Valley's historic fiber industry, we believe in the economic and environmental viability of flax. Fibrevolution is ready to devote time and capital to building a flax fiber processing association of farmers, textile professionals, manufacturers, seed breeders and university researchers. Together we will inspire our community to participate in the revitalization of flax and linen in the Pacific Northwest! Fibrevolution is a seed-to-seed producer of high quality organic bast fiber, yarn, and cloth born of regenerative processes, sustainable systems, carbon farming practices, regional manufacturing and community education. We envision a regional farming network, centered around a bast fiber processing facility in Oregon, which will grow, produce, and distribute bast fiber to textile, apparel, and biocomposites markets.